The excessive wet soil conditions during the 2017 corn rootworm (CRW) hatching period during late May – early June caused a major reduction in corn rootworm adult populations during the 2017 growing season. Adult surveys in most fields during early August showed a scarcity of adult beetles during the egg-laying period. As a result, most fields in NY will have a reduced risk for CRW damage during the 2018 growing season. In these lower risk fields, CRW management costs can be reduced by growing non-Bt-CRW corn and using either a reduced rate of soil insecticide or the 1250 rate of seed treatment. First year corn is never at risk from CRW and therefore Bt-CRW corn, a soil insecticide or the 1250 rate of seed treatment is an unnecessary expense. This includes any application of Capture in the pop up fertilizer. Well drained fields which did not experience the typical periods of water logged soils during late May – early June 2017 will be at higher risk from CRW injury in 2018 and should be managed accordingly. These higher risk fields may benefit from planting Bt-CRW corn varieties. In “normal” years, the risk of economic damage from CRW is 0% – 1st year corn, 25%-35% – 2nd year corn, 50%-70% – 3rd year corn and 80%-100% for 4th year and longer continuous corn. CRW Bt resistance continues to build across the corn growing regions of the US with multiple localized resistant populations identified for each of the Bt-CRW traits. Cross resistance has been identified within the Cry3 family (Cry3Bb1-Yieldgard Rootworm, eCry3.1Ab-Duracade, mCry3A-Agrisure RW) and if one of the Cry3 traits are failing in your field, the planting of another toxin within the Cry3 family may lead to disappointing CRW management results. Resistance has also been reported in several states to Cry 34Ab1/Cry35Ab1. There has been no reported cross resistance between the Cry3 family of toxins and Cry34Ab1/Cry35Ab1 toxin combination. The rootworm Bt-toxin pyramids consist of two different Bt-RW toxins in the same plant. Some seed companies have included two different toxins from the Cry3 family where cross resistance has been reported where other seed companies utilize the pyramid mix of a toxin from the Cry3 family and Cry34Ab1/Cry35Ab1 where no cross resistance has been reported. If control failures have been reported in your fields/region to any one of the Cry3 family of toxins, planting a pyramid composed of two different Cry3 toxins is not recommended. Instead, it is a better CRW resistance choice to plant a pyramid consisting of a Cry3 toxin with the Cry34Ab1/Cry35Ab1 toxin. As Bt –CRW traits are failing to resistance by corn rootworm, the promise of the next effective trait is ever appealing. The development of the RNAi technology against CRW has been touted as the next effective plant incorporated toxin with a very slim chance of resistance development by CRW. However, it only took about 20 million individuals from a single Illinois continuous corn field and a few generations to generate an RNAi resistant laboratory population. In addition, field results with RNAi containing corn varieties suffer a noticeable amount of root feeding damage before the slow-killing toxin kills the insect larvae. As a result, the new RNAi technology will not be the “silver bullet” everybody has hoped for. Stewardship of the Bt technology has become increasingly important in areas where Bt resistance has not been reported because the next technology needs effective Bt toxins to help it out. A few simple management adjustments can go a long way in preserving the efficacy of the Bt-CRW traits in NY. Long-term corn fields need to be rotated to a non-corn crop on a regular basis. Continuous corn matched with a long-term use of same Bt-CRW trait promotes the development of a resistant population. Rotate toxins between the Cry3 family and Cry34Ab1/Cry35Ab1 toxins. There is no recorded cross resistance between these two groups of toxins. Use the Bt-CRW technology only in fields of 3rd and longer continuous corn fields. Rotate the toxin groups and rotate the long-term corn to at least 1 year away from corn to break the CRW cycle. Plant some fields to non-Bt-CRW varieties and use either a granular soil insecticide or the 1250 rate of seed treatment. Liquid insecticides in the popup fertilizer are not effective and not recommended. Comments Off on Does High Quality Alfalfa Pay in Mixtures? Many alfalfa varieties currently on the market have claims of higher forage quality such as: fine stemmed, lower lignin, higher neutral detergent fiber digestibility (NDFD), higher relative forage quality (RFQ), high multifoliolate leaf expression, superior digestibility, higher feed intake, improved milk production, and superior forage quality. Higher quality alfalfa and grass varieties have the potential to significantly increase milk production and increase the proportion of homegrown feeds in rations. Increased fiber digestibility is the most important quality improvement. Changes in plant architecture (fine stems, multifoliolate trait, etc.) can lead to modest improvements in alfalfa forage quality. HarvXtra-type alfalfa varieties have reduced lignin content due to a genetic modification in lignin production. There are at least two varieties conventionally bred for reduced lignin. Reduced-lignin content by itself is of little benefit, unless it impacts NDFD. Reduced lignin could lead to increased lodging, although increased lodging has not been observed in low-lignin alfalfa varieties. Increased NDFD without large reductions in lignin also is a reasonable option, if possible. While alfalfa can significantly impact grass CP content in mixtures, grass has little impact on any alfalfa quality traits in these mixtures. This means we can compare alfalfa varieties in mixtures and expect similar results as if they were in pure stands. Alfalfa-grass trials harvested in NY in 2017 included HarvXtra, Hi-Gest 360, LegenDairy XHD, WL 356HQ, WL 355RR, and Pioneer 55H94. Each individual trial contained 2-3 alfalfa varieties, with from 3-7 grasses, including meadow fescue, tall fescue, orchardgrass, festulolium, timothy, and reed canarygrass. All 2017 NDFD data here for alfalfa and grasses was based on weighted means over a 3 or 4-cut season (so higher yielding spring-cut forage counts more in the NDFD averages). How does grass affect any delay in harvest? One of the advantages for HarvXtra is the potential to delay harvest and end up with higher yields of similar quality, compared to conventional varieties under standard harvest regimes. University trials indicate that HarvXtra harvest can be delayed somewhere between 5 to 10 days and still have similar NDFD (48-hour) as a conventional variety harvested under a standard regime. Delayed harvest for HarvXtra could result in one less harvest per season, with similar or higher yields combined with less stress on the stand. But those estimates are for pure alfalfa stands, almost 90 percent of the alfalfa acreage in New York is sown with a perennial grass. Grass in a mixture will dilute the high NDFD effect of improved alfalfa varieties. Based on NY 2017 data, pure HarvXtra harvested 5.5 days later provides similar NDFD as conventional varieties on a normal cutting schedule, but that interval shrinks as more grass is found in mixtures (Fig. 1). If a mixed stand is 30% grass, the HarvXtra advantage will be reduced to 4 days, and to less than 3 days at 50% grass. Fig. 1. Influence of grass on overall forage quality. Number of days that HarvXtra harvest can be delayed and maintain total forage NDFD similar to a conventional check variety on a normal harvest schedule. Based on 5.3% increase in NDFD for HarvXtra in NY in 2017, and an estimated loss in NDFD of 0.5% units/day for alfalfa and 1.0% units/day for grass. For this discussion, we are assuming that a one-percentage unit increase in NDFD likely results in significantly increased milk production. Our 2017 results on average showed a 5.3% increase in NDFD for HarvXtra over other alfalfa varieties. 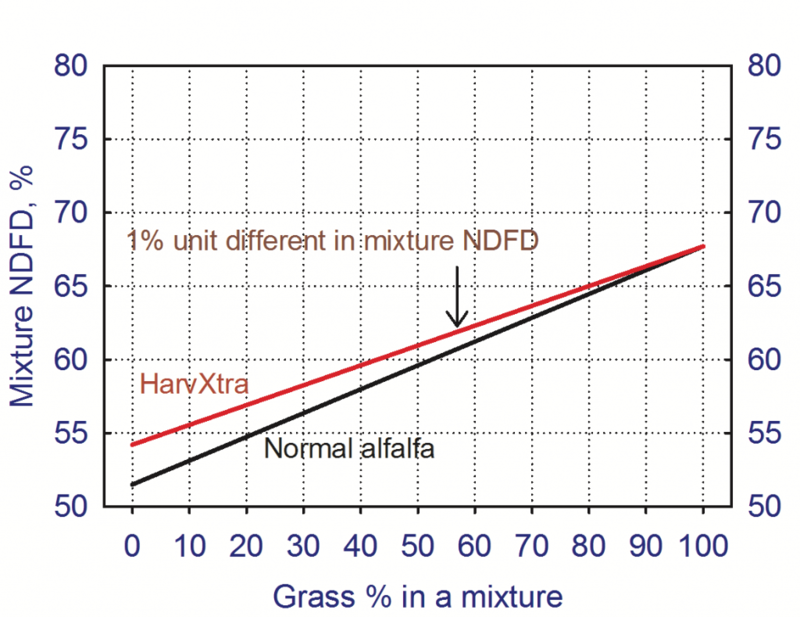 Replacing a conventional alfalfa variety with HarvXtra should result in a significant increase in mixture NDFD (one percentage unit) for a stand that is up to almost 60% grass (Fig. 2). 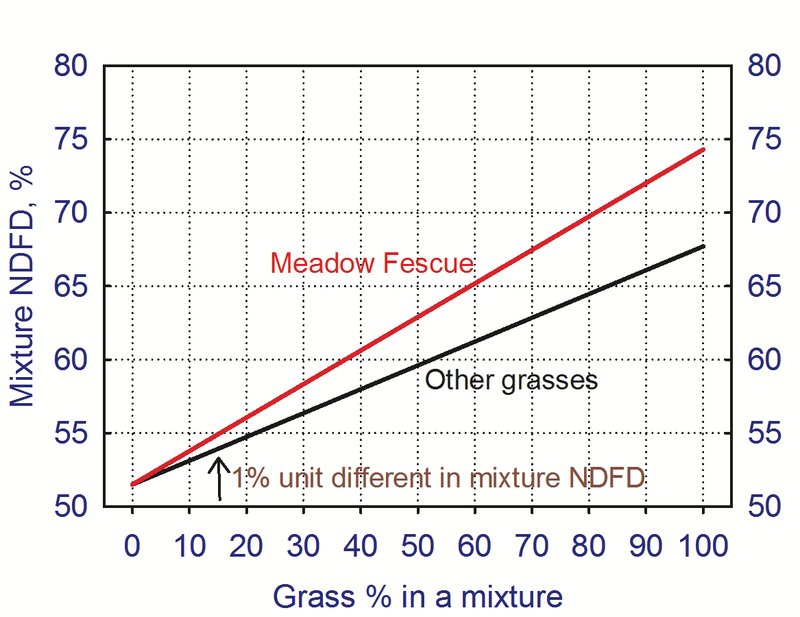 Replacing a lower quality grass with meadow fescue, however, results in a significant increase in mixture NDFD down to as low as 15 percent grass in a mixture (Fig. 3). This is because grass NDFD is much higher than alfalfa NDFD. Our results in 2017 show that replacing a lower quality grass with meadow fescue increased grass NDFD an average of 9.7%. In a stand of 30% grass, the exact same increase in mixed forage NDFD is obtained by the addition of either HarvXtra or meadow fescue. As low as 5% of any grass in a mixture with alfalfa will significantly increase mixture NDFD (one percentage unit). Fig. 2. Effect of alfalfa variety on NDFD of an alfalfa-grass mixture. Based on average of 5.3% higher NDFD for HarvXtra over other alfalfa varieties in NY 2017 trials. Fig. 3. 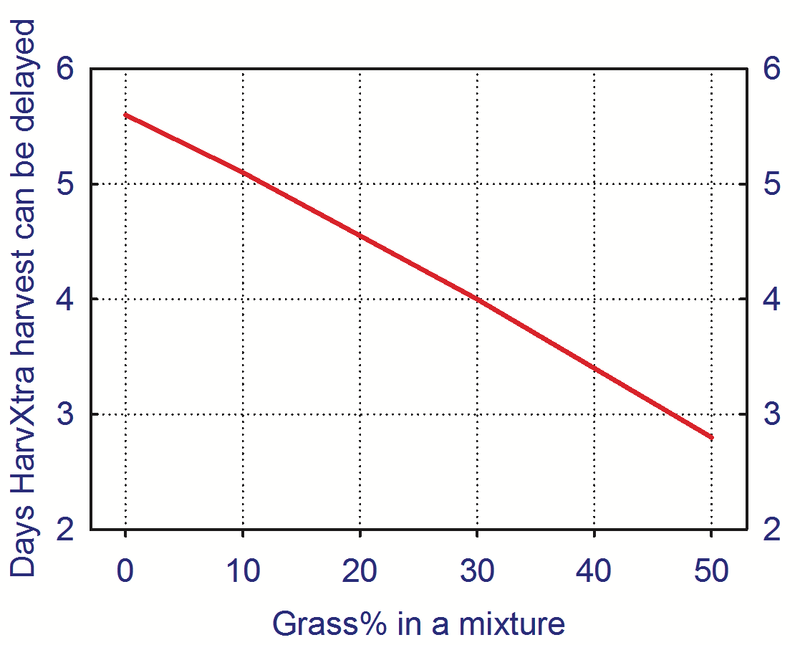 Effect of grass species on NDFD of an alfalfa-grass mixture. Based on average of 9.7% higher NDFD for meadow fescue over other grass species in NY 2017 trials. If we assume that HarvXtra seed costs about $6/lb more than other high quality alfalfa varieties, and is seeded at 14 lbs/acre, then over the average life of a stand (4 years) HarvXtra would cost about $20 more per acre due to seed costs. Meadow fescue does not cost significantly more than other grasses for seed, so there is no added seed costs for switching to meadow fescue. An increase of one percentage unit NDFD (neutral detergent fiber digestibility) has been shown by feeding trials to increase milk production about 0.5 pound per cow per day. For high producing cows, the increase may be as high as 1 pound of milk per cow per day for every one percentage unit increase in NDFD. Based in NY 2017 trial results, the addition of HarvXtra and meadow fescue increased NDFD an average of 3.5 percentage units. 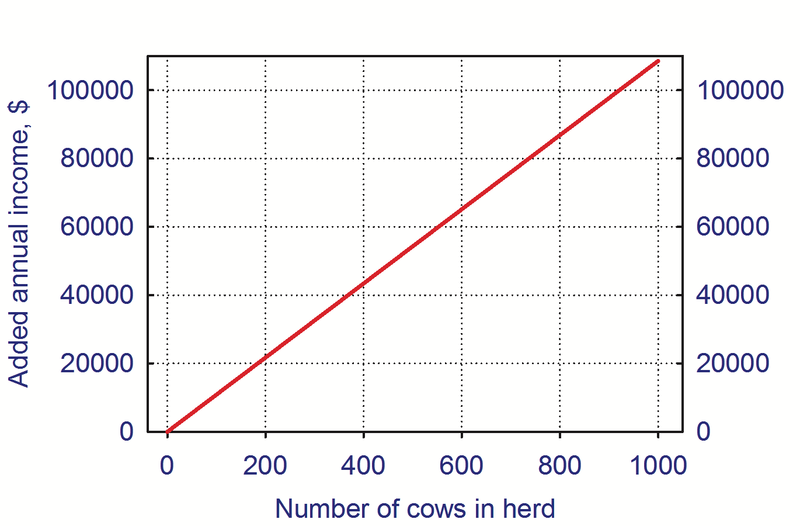 Assuming a milk price of $17/cwt, a 1000 cow herd could increase annual milk income by $100,000 by planting HarvXtra/meadow fescue mixtures (Fig. 4). The added seed costs for using HarvXtra are not significant. Also, changing varieties or species planted is relatively farm-size neutral, with equal benefits per cow with small or large herds. Fig. 4. Annual increase in milk income by using HarvXtra alfalfa and meadow fescue mixtures instead of normal alfalfa and other grasses. Based on 3.5% unit increase in NDFD in NY in 2017, and assuming 1% unit increase in NDFD = 0.5 lb milk/cow/day. Assumes a milk price of $17/cwt. Planting HarvXtra alfalfa plus meadow fescue may increase milk income an average of $100/cow/year. Other varieties recently released with potentially higher NDFD have not been adequately evaluated. Any alfalfa or grass variety with significantly higher NDFD than conventional varieties is going to be worth the price of admission (higher seed costs). Switching from a lower quality grass to meadow fescue can impact forage quality of mixtures just as much as a switch from an average alfalfa to HarvXtra. The greatest challenge for alfalfa-grass mixtures is getting and keeping a reasonable amount of grass in the mixture (20-30% grass). For alfalfa-grass producers, there is the added issue of having to pay for the roundup-ready trait in HarvXtra, without a practical way of utilizing that trait in mixtures. Roundup-Ready has been bundled with reduced-lignin, with no intention of ever separating these two GMO traits. The recent interest in production of “GMO-free milk” (produced with a very small amount of GMO-type feeds in a cow’s ration) could impact the success of GMO reduced-lignin alfalfa varieties, if the general public embraces this product. Alfalfa-grass research was made possible by funding from the Northern New York Agricultural Development Program and the New York Farm Viability Institute.